Hitler's escape would have embarrassed and infuriated the jews. WWII is all full of big lies. We might learn the truth and we might never learn the truth--50/50, but we can be 100% certain the truth won't be coming from a Jewish source. "Hitler’s last days were not spent in his Berlin bunker, but in tranquil luxury in an Argentine hotel"
I hope so. I also have fantasies about Fu fighters and Fu bombers coming swooping out of underground Antarctic bases! You think there's a chance that, at least, Hitler could have escaped Berlin? Seem doubtful, let alone the Argentina trip. BTW, curious about posters' opinions on Hitler's last will & testament? Actually I just found some interesting info so I'm gonna post a separate thread. Remarkable interviews with the circle of confidantes who surrounded Adolf Hitler in the days before his suicide have been shown for the first time on German television. In testimony from beyond the grave, the group of aides, secretaries and friends described life in the squalid bunker retreat beneath the Reich Chancellery in Berlin as Russian troops moved in. They revealed intimate domestic details of Hitler's favourite tea, the love letters from his admirers and the love song that he and Eva Braun, the woman he married in the underground hide, listened to over and over again. The death of Adolf Hitler is one of the most discussed topics in Holocaust resources. People are interested in finding out how this powerful man actually came to death. Most are interested in seeing what happened because they want to know that he was properly punished for his crimes. Others are interested in knowing how Hitler died simply because they want to get the details behind his suicide. That's right. 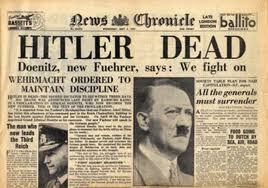 Adolf Hitler committed suicide with his wife on April 30, 1945. While it is told that he did this to avoid 'making a spectacle of himself', the actual reasons are known only to Hitler himself. A lot of people also look at the Nazi ideal of 'death before dishonor', to which some attribute the suicide of Hitler and many other Nazi Party members who also chose this route for their own deaths. The reasoning might never actually be known, but the method is described in detail in most Hitler biographies and resources that outline his rise and fall as the Fuhrer of the Third Reich during the 1930s and 40s. Adolf Hitler and his wife were married just 40 hours before their death, in a small civil ceremony. They spent the remaining hours with others before retiring to Hitler's personal study around 3:00 PM on April 30th. Since Hitler had known for many weeks that he was going to commit suicide, he had a plan in place. An SS doctor had instructed him that suicide by cyanide poisoning followed by a gunshot to the head was most effective. Therefore, he obtained cyanide for him and his wife and waited until the time was right. They both ingested the cyanide, and before it took effect Hitler shot himself in the head with his own pistol. Eva Braun, his wife, did not suffer a gunshot wound. She apparently died from acute cyanide poisoning. It's not known whether Eva didn't want to shoot herself, if Hitler couldn't bring himself to shoot her, or what the case may have been. He likely shot himself to ensure that he died in the event that the poison was not effective enough. There is a lot of speculation about why Eva Braun was not also shot, but it's an answer that no one will truly ever know. Although many people see suicide as a cowardly way out, it was the preferred method for Adolf Hitler and many of his leading men who didn't want to face public persecution for their crimes against humanity.